This post will be where the recent changes will be listed for ease of reference. Completed my Surface World ideas for Depth and Biomes tonight. Perhaps still a little rough in presentation. But, I think it's worth bumping this topic so people can see the progress. Started work on Depth and Biomes tonight. Sort of scrambled out an overview of most my depth plain ideas, as well as an introduction to what exactly a 'depth plain' is. I had planned on working on my ideas for the surface world tonight, but it seems I sort of worked on everything but that in this section. Still, all the ground work is done, so, I should be able to hop right to that when I do my next typing stent. Took out some of the lofty posts in the 'Introduction to the Showcase' section. Replaced What is Dwelvers? subsection, as well as 'Things I Think Should be Considered' subsection with the simplified 'Aims' subsection. Highlighting what will be covered in a more easy to digest format. Did mostly more organizational work. Added Picture headers in purple text to help break up the sections. Started adding a number reference system in for the various sections and subsections. 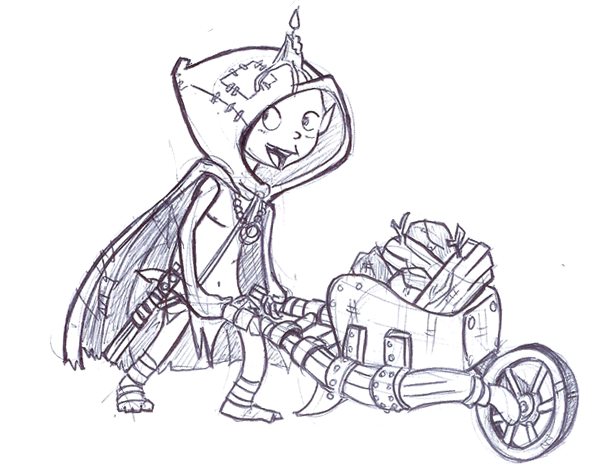 Had to condensed the Imp with wheel barrel and cloak concept into a link, because the forum only allows 15 per post, and I'm likely to have more than that. Lastly, did more rough work on the Job Types Section. But nothing Grand. Finally got around to Correcting all (or at least most) of the grammar and spelling mistakes. Discontent mechanic renamed Disgruntled under Creature Mechanic - Disgruntled, Revolt; as this feels like a more natural term for it. Please bare with me. This is a rather huge collection of ideas. And it's going to take some time to record them all in way that's legible for others to understand. Increase the feeling of Production in Dwelvers by increasing the complexity of production chains. I will also opt for an option of 'Game Complexity', adding more stations and making chains more complex with increase in it's difficulty. Allowing for an alternative to 'enemies are tougher and attack you faster' difficulty without replacing it and giving players a chance to get their barrings on simpler game play without being overwhelmed. Linking Research and progression to a need for exploration by introducing various relics that can be found, mined, and studied to progress not just magic, but units, buildings, traps, stations, magic, and alike. Give the player a sense of progression from the start of their dungeon to the end by use of upgrades. Increase the diversity of monsters by adding various stats to allow each to be more unique. Including the addiction of Elite creatures, which will be a risk/reward and more troublesome to keep happy. Increase the scope of the game by adding more, or what I like to call 'depth plains', not only having the underground and Surface world, but 2 additional depth plains below the default, and 2 in the sky above the surface. Having rarer materials, and giving purpose to a player's exploration and conquest. Present a reasonable creature fusion system and linking it to research by simplifying it into a recipe system which require Genomes. Fossilized crystals that can be mined and combined to make new creatures. Also, dividing hybrid creatures into hybrids, and chimeras. Allowing for more diversity, with a lower work load, as well as giving room for new creatures to be added later with ease, as well as giving the potential of modders later down the line to add in even more Chimeras. I have decided to include a color code that will be universal among all the following sections and subsections. Section headings and Subsection reference numbers will be this shade of purple. Ideas that rely on another suggested concept will be displayed in Green. Ideas that alter or outright overhaul a previously suggested concept will be displayed in Yellow. Anything with the [link] [/link] tags surrounding it, is a place marker for things that will be linked to other posts later on. Please bare in mind, this is a large collection of ideas. And while I am making effort to keep them as organized as possible, over sites will happen. For the purposes of ease of use, I have decided it would be best to break my concepts and purposed ideas into posts as they might have been seen in the forum. • Completed Sections and Subsections will be shown in this shade of Green. • WIP Sections and Subsections will be default white. 11: Let's talk Chimeras! My take on the Hybrid Making System. Introduction: This is a a pretty rough concept! 12: Example Chimeras, Recipes, and Hybrids. * Tweaked or utterly altered version of another persons suggestion. ** Tweaked or utterly altered version of something already in game. The aim of this first section is not only to introduce new possible creature concepts and a fit them into roles in the game, but also, to give different creatures more diversity a bit more diversity beyond just 'this has higher hit dice', while keeping in mind the amount of monsters a player will be managing, and keeping it nice, simple, and streamlined. I opt doing this by introducing a few, what I consider to be simple mechanics, that go beyond things such as it's base damage and alike. Forcing players to suit the needs of their minions on more levels than 'feed me and give me a place to sleep'. These creatures given example below, a few I'm quite partial to, will be catalysts to see how these various ideas could be given life within the game. But we're getting a head of ourselves, let's start with the outlined mechanics that I believe will breath some life into them a little more practical than the idea of celebrations I opted in one of my previous suggestions. The diet mechanic is a means of varying out some of the needs monsters in the dungeon might have. For one, I purpose a diet system that would vary up the things various monsters will, and are capable of eating. I also propose a food quality system, meaning that stronger monsters, or potentially just monsters that have reached a certain level, will require high quality food, thus forcing the player to provide their monsters with a variety of different food items, and forcing them to seek out higher level food supplies if they wish for a stronger fighting force. With this idea I not only purpose different types of food, but also, different types of stations required to prepare it. It is important to note that a lot of creatures eat more than one food type, and they will automatically eat the easiest to receive food type if given a choice. I also like the idea, albeit not at all being a fleshed out concept, of creatures being able to eat one food type, but require another food type in less quality in lower intervals. An example of this might be something like, an Orc can eat bread 90% of the time, but every tenth meal or so they will require meat. Making the orc wailing of "I need some meat!" make a lot more sense. Pastries are the most common food available, and eaten by almost all low tier creatures, at least at their lowest levels. Bread is an example of a Pastry. All Pastries are made on the baking table, as it is present in the game now. Possibly, higher level pastries will require rarer ingredients atop the simple antroot and water (see food quality below). Meat requires a little more effort to attain, and while fish is good for some creatures by itself, other rarer meats will require some effort to find or construct a steady supply to keep minions well fed. Meat requires more effort to prepare, for one, whatever it is that can become meat, must be taken to a [link]Butcher Block[/link] to be made into meat. And while certain things can be eaten without this preparation, it will not yield as much reward as meat that has been prepared on this station. For example, a fish would no longer go straight to the table, but rather, go to the [link]Butcher Block[/link] and be made into fish-meat. This also allows players to do something with their captured prisoners other than feed them to their dark mother.. if you catch my drift. Meat also requires cooking after it has been butchered, and must be taken to a [link]Cooking Pot[/link] where it can be prepared into a meal. As of now, I opt for all meat of the lowest tier to simply be made into a nice bowl of meaty stew. Higher tier meats could be made into different types of meals to convey their significance over the lower tiers. Some creatures of a taste for things that have been.. ripened a little more by time. This is where things get a little tricky, as I'm unsure how to separate the production of meat and carrion without it being to 'hands on'. But I very much think the idea is cool. And while most creatures will see this as gross and inedible, some creatures will consume it exclusively. The production of Carrion does not require, but is significantly sped up by whatever item, we're gonna call it item 'x', being placed in a [link]Compose Heap[/link]. Once there, it requires time to rot significantly before a creature with a pure carrion diet will touch it. Carrion is more the food of beast like creatures, so I doubt it will be eaten at the table. For now, I mostly see this being the food source of Blight Hounds, Gnolls, or perhaps another Hyena like Hybrid. Carrion is made with both bodies, and meat, meaning it requires the player to make a choice between producing meat, or Carrion; or force them to split their production chains to produce both types of food. Carrion also takes longer to make than Meat food, thus, making it harder to recover from if the supply goes awry. This is the last food type, which also happens to be my replacement for 'mana' in the game. Neathergy the energy made of tormented, damned souls. And can be made with the ceasing of souls from captured foes, or, more practically, from farming Neathergy from [link]Nether pits[/link] shattered through out the [link]depth plains of the underdelve, and the abyss[/link]. Creatures that consume this present a problem, as they can take large chunks of players mana pool, meaning that to many could cause a rather horrible collapse in dungeon infrastructure, or perhaps just making it impossible to cast the right spell, at the right time. Nethergy will be covered in more detail in another section of this showcase. I am considering separating Neathergy from another Mana like property, the other being Favor. Which could be received through prayer to dark gods. Having two sort of spell power pools. This is a looser mechanic I don't wish to hammer down yet, as it could be altered to suit other mechanics a fitted into the game. For Example, if every creature is a allowed to cook, as suggested by the current pole of Choose which creatures should do what in Dwelvers?, Piggehs could simply be the best at it, thus the meals they prepare have a higher 'Food Quality', and thus, yield far more rewards when it comes to hunger; or perhaps sate the same amount of hunger, but give bonuses to creature loyalty, mood, or alike. It could also be handled by allowing creatures to make more advanced dishes, and perhaps Piggehs simply have the ability to cook food faster even though they are rather slow moving (Something that could be made up for with the [link]Transfer Table[/link]) And higher food quality could be made with more ingredients. Food quality, as it is now, is a sort of 'unknown variable', one that should be considered, even if it is a mechanic that could be handled in several different ways. Not so much a mechanic as it is a reference word. Quirks refer to things that make the creature unique in terms of their basic maintenance. For example, the quirk of the orc is 'requires alcohol'. For none elite, and non legendary creatures, all quirks should be kept relatively simple, keeping in mind the sheer amount of creatures players will be managing. With this mechanic, creatures will not just become unhappy and instantly revolt, but rather, have special, unit unique minor protests when they are unhappy. This will be labeled Disgruntled, and is inspired by the description of the Rogues on the web site. These acts of deviance, while not a full scale revolt, can be very problematic if not seen to. Each unit will have their own way of expressing being Disgruntled. Rogues will incite rumors and chaos if they are not pleased, pitting creatures against one another. Orcs, however, could shake down imps they see, bullying them and hindering them from their tasks, while Piggehs could produce food with much lower ]Food Quality, or perhaps just much, much slower. It is important to note that no Disgruntled reaction (Or at least most Disgruntled reactions) is outwardly violent to the point where other creatures will attack the creature executing the actions. This is a double edged sword, for while an uptight creature won't instantly be targeted and killed by it's former allies, having them left unchecked could lead to even more disastrous results. Revolt reaction is what happens when all mood, and loyalty has dropped to a dangerously low level. Not all creatures will begin to attack, however, these reactions are far more violent and troublesome than discontent reactions. Some Creatures attack. Others simply leave never to return. The rogue could perhaps attempt to steal valuable resources and leave. Some could even explode. There is a number of creative things that could happen rather than them simply attacking your still loyal creatures. This mechanic is to prevent one monster going into revolt, and instantly being killed by it's friends. Whenever creature goes into revolt, it has a chance of rallying other creatures with the same troubles and complaints to join it's cause. This means that orcs upset about no beer, have a good chance of all of them revolting at once, rather than each going mad one by one and being killed by it's allies who all have the same complaint. There is also a small chance that a creature with a violent revolt reaction, to incite creatures with non violent revolt reactions, into violent ones. Now, that's sounds a little confusing, so allow me to explain. If a creature with a violent revolt reaction, such as an orc, incites a creature with a non violent revolt reaction, such as a piggeh, who I simply see as leaving if displeased, into a revolt; that piggeh will then, instead of leaving, join the orc in violent revolt. This makes creatures with more violent revolt reactions more harmful. A creatures Presence will also factor in to weather or not it can incite other creatures into revolt. Meaning creatures with a higher Presence, have a higher chance of inducting other creatures to their cause. Here is a basic overview of how the mechanic might work. If a creature looses enough mood, and loyalty to begin a revolt, it has a high chance of draining a large chunk of loyalty from creatures of the same type as it, who have the same complaint. Ie, if an orc becomes mad because it has no food, all other starving orcs have a high chance of loosing large amounts of loyalty, and thus, going into revolt mode as well. Creatures that are not of the same type, but have the same complaint have a smaller chance of loosing loyalty. It should be noted first that Loyalty is not a replacement for the current mood system already implemented in the game. But rather, a system that is supposed to work along side it. Mood will be effected over short term needs. While Loyalty is effected over having mood either negative, or positive over a longer period of time. Loyalty, as I see it, is separated into three stats. Max Loyalty, Loyalty Rate and (current) Loyalty. Loyalty represents how loyal a creature is to his aligned hand or master, a stat that increases over a very slow period of time provided they are kept happy. A creature with a low max loyalty will revolt far quicker than one with a high one. So players will be rewarded for keeping their creatures longer, and keeping them happy longer. When a creature becomes unhappy, they begin to loose loyalty, and it isn't until that is drained that they begin to revolt. Loyalty rate determines how much loyalty a creature is given over time, one with a high loyalty rate will become loyal quickly, while ones with lower loyalty rates are slower to do so. Also, each creature would have a max loyalty, which indicates just how loyal a creature can possibly be. For example, a Rogue should have a very low Max loyalty, meaning they revolt and cause mischief far quicker than other, more loyal units. This can help a lot with balance of stronger creatures, even if it makes the system of making creatures more complicated. It allows for more factors to need to be considered in ones fighting force. And gives more wiggle room for simple drawbacks to be implemented for stronger creatures. Sure an orc isn't that impressive, but perhaps it's fiercely loyal? This System is a a fight or flight mechanic, meaning even creatures with full health have the potential of being so frightened they do not wish to engage in combat, instead, turning tail and running for their lives (or perhaps multiple different reactions. This will be controlled by a number of stats, including Bravery, Presence, Moral, and Loyalty. Presence is a creature stat that determines how much Moral it contributes to as a whole on the battle field. For example, a cyclotaur might have a presence of 50, while an orc has a presence of 10, meaning having a Cyclotaur in the fray might makes other units as brave as they would with 5 orcs backing them up. Moral is the total pool of bonus Bravery a unit gets from being near other creatures. This is best explained by an example. Let's say a battle party is composed of 3 orcs, and 1 cyclotaur. Each orc has a Base Bravery of 10, while the Cyclotaur has a Base Bravery of 30. Now we take the presence of every creature, add it together, and that makes the moral of the group, then we take that moral, and add it to the base Bravery. Then, each unit will also get a bonus for their individual Loyalty. So, using the numbers from the presence outline above, that would be 3 orcs at 10 presence each, and one Cyclotaur at 50. Please note the math here is not exact, this is just a loose example to show how the math would work. I will say this, however, Health would need to be the stat that this system is designed around. As the system would need to reflect them fleeing at a low health level unless in a large group. So, now lets determine the New Bravery of each creature in that example party. These will be measured against the Moral of the other side, determining if the creatures fight until near death. Or simply turn and flee at the sight of overwhelming, or just, potentially terrifying odds. The moral and Health are constantly shifting varibles. If 2 of the orcs were fell in battle, or fled from the battle, it would look like this. Entertainment fills the role of sort of 'mock Loyalty'. The idea of it, as it stands, is a buff to Loyalty that is far easier to get, but doesn't last nearly as long, requiring upkeep. Like Loyalty, Creatures have a max Entertainment level, an Entertainment rate, and a (Current) Entertainment level. Each of which acting rather similar to their Loyalty counterparts. However, Entertainment does not directly take the place of Loyalty. But, rather, can only slow the rate in which loyalty is lost by upset creatures. This requires it to have one more stat, which factors the max amount of Loyalty it can be substituted for when loyalty is being lost. A stat I will call the 'Loyalty buffer'. In other words, An orc without beer will inevitably revolt if not given any. However, it won't do so quite as quickly if he is properly entertained. Each creature could also have a favored form of entertainment, or perhaps things that do not entertain them at all. But this can be tricky, as things should be made in effort to be kept streamlined and simple. Right now, in this outline, there are two items that yield entertainment. One is the [link]Stage[/link], which will be a station on the dining hall, and the other, will be the [link]Stocks[/link], which prisoners can be placed in to be belittled by your creatures for the purposes of entertainment in various ways. This Conception Idea is made with the idea of having all creatures being able to do any job, but having some be better at jobs than others. It is a counter balance measure to give players a reason to not simply make all the creatures that are best for the job. I mean, if Piggehs are the best cooks.. why wouldn't you just make Piggehs for all your cooking jobs? Well, this rough idea for a system is meant to address that. Or, at least, spark the idea that it is something that could, or should be addressed. As it stands, Comradery is a stat that gives creatures some form of bonus for the more of it's own kind are employed in your dungeon. And while how the bonus effects the creatures is currently not hammered out, the idea of giving players a counter incentive to specialize in creature types is still conveyed. While, as mentioned, the comradery system is still a very rough concept. I have an idea of what variables will need to be implemented for it to work, these stats are Total Comradery, Comradery Multiplier, and Creature Pool. Total Comradery: will be the end stat bonus after all the individual bonuses are tallied. Comradery Multipier Will be how much each individual creature contributes to the Total Comradery. This is to balance out high end creatures, which you'll need less of, from low tier ones that you will likely have more of. A orc, which is a low tier creature will have a much lower Comradery multiplier than an elite creature, which there will be much fewer of. Creature Pool: This is a means of allowing creatures to be grouped and give comradery to one another even if they aren't the exact same type. An example of this could be Orcs and Goblins. Which while they are not the same unit, could both be part of the Goblinoid creature pool, allowing both their Comradery Multipliers to be stated to give them all the same Total Comradery. Here's an example of these variables in action. Bare in mind, again, this is a super rough concept. Bob the Dungeon Master has a bizare love for Goblins, so his entire dungeon is composed of Orcs, Goblins, and Trolls. Orcs have a comradery multiplier of 2, while Goblins, a lesser creature have a comradery multiplier of 1. Orcs and goblins share the same Creature Pool of Goblinoids. He has 10 goblins, and 6 orcs. Meaning his current Total Comradery for all these creatures is 22. Later, he unlocks Trolls, which while fit into his theme, do not have th same creature pool as orcs and goblins. Trolls have the creature pool of trolls, and they are much harder to produce. But that's okay, because their comradery multiplier factors this in. Trolls have a Comradery Multiplier of 4, meaning even though he only has 3 trolls, the troll Total Comradery is 12. This is more addressing a problem with the game as it is at this current moment where one can have all there Piggehs at level 10 simply from cooking pastries, making them stronger units than the all your Cyclotaurs, which max out at level 4 from training. If Crafting things is to give units EXP. That EXP should be kept completely separate from battle EXP. In the current game, if a knight is spawned near a collection of feral Impanzees, they instantly ignore one another and focus aggression on the player. I don't think that's quite right. This Faction system, while not fully fleshed out, is a means of giving a label to a future mechanic that will address this issue. This is a very rough concept at the moment, I will attempt to add more to it later as it's hammered out a bit better. This system is baring in mind the concept of Choose which creatures should do what in Dwelvers? if the option of 'Creatures and Imps can do the same jobs - not all of course, but some could do this, some that (so we don't have division for Imps and Creatures, all are the one workgroup).' is used. Which is the top voted option. This list is an attempt to sort out the various job types. I'm attempting to separate them into groups for an idea I'm tossing around. But also for organizational purposes. Fishing: Fishing from Wooden Bridges. Taming: Taming and study of wild beasts. Mediating: The ability to mediate disputes, or negotiate diplomacy. Baking: The making of Pastries. Cooking: The making, and butchering of Meat. Fermenting: The making of Alcohol and decomposition of food into Carrion. Smithing: Construction of Melee weapons and armor at Forge. Also effects the Grindstone. Arbalism: Construction of Missile type weapons, like Crossbows, or Bows. Imbuing: Imbuing life into objects. Channeling: The performance of Channeling Nethergy for the Dungeon Master to cast spells. Scribing: The Construction of Grimoires, Scrolls, and Tomes which are used in spell craft. Trap-making: The construction of traps. Gadgetry: Construction of various gagetry, such as special devices or automative stations. Drafting: Drafting of Schematics which are needed for various advanced gadgets and traps. As the system is now, each creature has a spot for left hand, right hand, head, body, legs, and boots. To me, with so many creatures, it seems like to many of these spots are attributed to what ammounts to 'more armor'. But honestly, how many spots -do- creatures need to increase that stat? Wouldn't it be silly to have a creature with iron upper armor, but cloth pants and sandles? Don't get me wrong, I -love- the idea of being able to outfit my creatures. But I can see the implementation of legs and boots being to much, and yielding very little extra reward. So I propose a few different spots be put in place of them. Here is how the equipment layout would look afterward. Body: Covers chest, legs, and boots. Mostly increases armor bonus. However, some alternatives can be placed here, sacrificing armor for some other use. Such as a Back pack, or Jet Pack. Head: Covers head. Increases Armor Bonus more, as well as protects from head effects. [link]Cloaks[/link] may also take up the head spot. Devices are my proposed replacement to the boots and legs spot. And is a sort of broad trinket spot that does not so much give bonuses to armor, as it does grant more utilitarian uses. These spots are where various things of usefulness can be equipped in combination to yield unique results. About to storm a high up place with fire happy wizards guarding it? Order you Minions to equip grappling hooks and rings of fire protection. About to lead an excursion to the surface world? Perhaps your orcs should bring Flasks with them so they are not in longing for their precious drink while terrorizing the top world. Need to send an emissary to another hand? An imp with boots of speed and a steam powered jet pack should be able to traverse almost any obstetrical with godspeed. Maybe your heading into a tough fight and you want to keep it simple? Two health potions will ensure your monsters stick it out for as long as possible, or perhaps wearing an idol of a dark god, to ensure they remained brave when faced with overwhelming odds? Purpose: Increases Carrying capacity. Allowing for imps to carry more than one item. Leather Backpacks only allow +1 item, making 2 total if bare handed. Purpose: Increases Carrying capacity. Allowing for imps to carry more than one item. Leather Backpacks only allow +2 item, making 3 total if bare handed. Ingredients 1 leather backpack, 3 sticks, 2 rope. Purpose: Increases Carrying capacity. Allowing for imps to carry more items. Allowing them to carry 5, however no long able to carry one extra item in hand. This can be combined with the backpack. Meaning a wheel barrel and sturdy Backpack could hold up to 7 items. The Rickety Wheel Barrel slowly walk speed by 30% (may require tweaking). Research required: Yes. Item Must be blueprinted on Drafting Board. Purpose: Increases Carrying capacity. Allowing for imps to carry more items. Allowing them to carry 5, however no long able to carry one extra item in hand. This can be combined with the backpack. Meaning a wheel barrel and sturdy Backpack could hold up to 7 items. The Rickety Wheel Barrel slowly walk speed by only 15% (may require tweaking). Research required: Yes. Item Must be blueprinted on Drafting Board. The Rickety Wheel Barrel must be blue printed before this research is available. Purpose: Decreases the negative effects of Sun Sickness when Sun Sickness sensitive creatures are on the Surface World durring day time. Purpose: Allows the consumption of Alcohol when Alcohol Meter is near 0. Becomes Empty Gourd when consumed. Purpose: Allows the consumption of Food when Food Meter is near 0. Becomes Empty Rations when consumed. Purpose: Consumed when Health is low to replenish health. Ingredients: ?? ?, ?? ?, ?? ?, Alchemy Work. Purpose: Used to higher areas. Research required: Yes. Blueprinted at Drafting Board. Implantation Requires: Requires a tweak for Ladder construction so that a builder must own the tile below, and above the area of construction to make this device useful. I was reading over the Back to Work post, and caught that the discussing of the surface world seems to be something of interest at the moment. So, I decided a better hammer this section out next. As of now, the surface world is present in the game, but inactive. I should start this series of ideas by stating that, while the surface world idea is certainly cool, this concept can be taken further. Something I have been referring to as 'Depth Plains'. Now, let's make sure we are all on the same page with terminology. Let's start by making sure we all understand the term 'biome'. For those of you unfamiliar with games that have used this mechanic, a biome is an a area in an open world game that is has it's own sets of rules for creature spawn, special features, and aesthetics. For an example, on the surface world, you could have a forest biome, a forest biome would have it's own art set, and it's own coded rules that would differ from other biomes. Like, say, a plain biome, or a mountainous biome, or a beach biome. This differs from you current system of Environmental objects. Not altering it, mind you, just more something it would be parented to. Look up games like <i>Don't Starve</i> or Terraria for examples of the term in action. Currently, in the game, the Maze is the only thing that could be considered a separate biome from the standard underground. Now that we understand that, lets discuss what I like to call Depth plains, Basically, It's just giving a terminology to something already in the game. Ie, we have the surface world, and we have the underground. The surface world is it's own Depth Plain, and the underground is it's own depth plain. What I'm suggesting is that you do not stop at just two, but rather, put more depth plains, both above, and below the current ones you have included. The lower or higher you go from the default plain (underground) the harder the creatures you encounter will be, but, also, will hold higher value materials. This is not something I suggest you do -now-, just something to bare in mind to see sort of picture this idea as a whole. Okay, a lot of ideas here are rough, but these are pretty set are much more core and I thin should be considered the most concrete. No matter how the ideas after it are altered. Viewing what depth plain you are on could function just like it does toggling the surface world/underground (Hitting 'z'), or it could be made slightly more complex, having a 'view next above' and 'view next below'. Each Depth Plain would have it's own biomes, and each biome within that depth plain would have it's own Environmental objects, creatures, materials, and alike. The lower or higher one goes from one's default plain (the underground), the harder the creatures are and the better the materials are one can find. Some items could be found in multiple Depth Plains, but are easier to find in lower Plains. Each Depth plain has it's own unique construction set. I believe this is an important feature of the game. You should not be able to build a cookery on the surface world, or the Dweldark (see below), it is room for your home depth plain. Nor would it make any sense for Raiding Camps to be built in the underground, since it's a room based around raiding villages on the surface world. These limitation will allow you to make plains more and more dangerous as the player venues further from it's home plain. Colonization of these deeper or higher plans should be far more limited, or require far more research and work. Making expeditions require much more forethought, and be far more risky. • The think the drop off from the underground to the Dweldark is to steep, it might be best for a depth plain to be placed in between them. Out of the 6 Biomes I have played around with, this is the highest of the Depth Plains, it is 2 depth plains above the surface world. I imagine it to be a sort of bright, vivid night sky with creatures walking on seemingly nothing. This, being the highest biome, it has incredibly dangerous creatures in it. I was thinking something along the lines of norse, or greek gods, but something unique to the Dwelvers universe. As well as lesser, but still ultra powerful Celestial beings, something like glowing wisps of light. I am of the mind that Dwelvers should have a feel of you being an evil underdog slowly spreading out and conquering. Doesn't fighting goodly gods seem like a logical end game? This Depth Plain is inspired by a sort of Jack and the Beanstalk Feel. Large floating cloud areas units can walk on, and rainbow bridges that connect them, as well as, perhaps, the occasional floating Island which holds Yggdrasils, a tree which wood has special properties and is needed to craft higher end items. I imagine Giants would roam up here, keeping in the theme noted above. Though, perhaps more 'goodly' sorts, like Nephilim sorts. As well as more angelic sorts. Perhaps they might even occasionally come down to the surface world to aid those below if you cause to much havoc down there. I don't think I need to explain the surface to much, I'm sure a lot of people have a take on the tone the surface world should have, so I'm going to concentrate on some rough mechanics I've been playing with instead. I want to start my idea volley of the surface world with a mechanic that has a heavy baring on a lot of the other mechanics I will be pitching out. Basically, your creatures are from the underground, and they do not like the sun, therefore, heavy, prolonged exposure to the sun will inevitably sicken, weaken and ultimately kill a creature. This Mechanic works best with a Day/night cycle included from the Time, Weather, and Seasons section (yet to be written up). This will provide pressure for raids and other activities on the surface to will best be preformed at night, lest you infect and loose your creatures. Each creature will have a sun sensitivity value, meaning that some creatures will be more susceptible to Sun Sickness than other. This will be important in further diversifying the value and use of different creatures. For example, an orc might be stronger than a lizard man, but lizardmen will be immune to sun sickness, and in fact, will be aided by the warmth the sun provides, giving value to lizard men even if they are not as strong as Orcs. Sun Sickness is not a simply debuff, if a creature is exposed enough, they will become ill, gaining a permanent debuff, if this continues, they will grow sick to the point of being incurable, and slowly deteriorate until they die. Once they have gone ill, they will not recover on their own, but need to be treated at the expense of materials, such as items to make a tonic or medicine to treat them. The effects of sun sickness will be different for each creature, but I think it should be stressed that players do <u>not</i> want to have more sun sensitive creatures exposed to the sun to often. To counter the effects, various items and mechanics should be provided to player to protect their creatures on the surface world. Such as Cloaks to hinder the effects, or Raiding Camps (tents) in which creatures can escape the sun provided it isn't attacked, or destroyed. You can preform a Ritual (currently unintroduced mechanic, but basically a complicated spell cast by the dungeon master) that will allow 'blotting out the sun', at the cost of material, this will likely be needed for longer raids, or ascending into The High Above or beyond. Before I go further, I will note a major change to the game required in order for some of these ideas to work. Portals in the underground no longer act as mystical passageways, but as common dungeon entrances. This means that for every portal in the game, there should be a corresponding entrance right above it on the surface world. This will make portals have more longevity, as they will no longer be one time conquests, but a constant threat of invasion from those wondering above, providing focal points the player must defend. This idea goes hand in hand with the Town and Villages Environmental Objects (possibly Biomes) that I will be outlining further down. Which will produce adventures to wonder above if left unchecked. This will provide an element I think is missing from the game, that being, the joy of defending your well made dungeon against the goodly greedy heroes that might hope to make a name for themselves at the cost of your head and holdings. I'm unclear as to how exactly a player would initiate a raid, or choose what creatures raid and at what intervals. But I have some basic ideas on how it might function. Settlement produce adventurers, and heroes eager to bring your dungeon to ruin. The amount of which directly connected to how expanded and prosperous they are. Settlements often (but not always) start small and produce only a handful of fledgling adventurers, but if left unchecked, they will eventually grow and prosper, spitting out more deadly heroic do gooders more frequently and of higher difficulty. Settlements growth rate will depend on their resources they have available. But, if such things are possible, A village will become a town, a town will become a city. They might even spawn more small villages around the city. I like the idea of the humans in this game acting much like they did in <i>the Settlers</i>, peasants roaming out and cutting down wood, building roads, and expanding. Only, now, instead, now they are the enemy. The way to counter there expansion, is by hindering their progress, raiding said villages and weakening there numbers, or outright burning them to the ground if you have the wish and strength to. But then, it might be best not to, for Settlements can be a prime resource for <i>prisoners</i>. Which I will be proposing to be made a vital part of many game components in another section (not complete). I see them not things to torture for information, or convert, as they were in Dungeon Keeper, but key components for Dark Rituals, Entertainment, Labor, Food, Experimentation, Research, and many other deliciously devious things. Castles are much more fortified structures. and have far more guards and knights than Settlements do. as well as large protective walls, archers that will attack anything that gets close. They do not expand, but the will repair themselves. They will also produce Knights and other units to attack your creatures if they raid any settlement it has produced. Castles produce settlements, It is a slow process. Each has a max number of settlements it can have Some where from 3 to 5. Settlements will remain even after their kingdom is destroyed, and sometimes will fuse with another castle, if one is close by. As your dungeon expands Underground, areas you have influence over will begin to cause rot and decay on the surface world above. Darkening the earth, causing plants and crops to wither, and alike. Once this Corruption is discovered by a settlement, that is when raiding and other aggressive actions from that Settlement will begin. Certain heroic units will have the ability to 'purify' the surface world, but in doing so, will hinder and destroy the parts of the underground you have built. Causing cave ins, and other irreparable damage to your dungeon without even having to set foot inside. This creates certain scenarios where the player is actually pressured to go top side, having to deal with the offending unit directly if they so not wish influential collapse. Plains: Flat plains, a favored biome to be settled by humans. Forest: A Biome thick with trees. Enchanted Wood: A myscial forest with it's own art set. Elves and faerie like creatures reside here, and could have settlements of there own. Mountainous: A rocky mountain side. Beach: Always next to an Oceon Biome. Falsharks, or Sharkmen often wonder here. Ocean: A large Body of water, acts mostly as a boundary. or 'Under Delve' as I like to call it. The default Depth plain you start on. So, most these ideas have to do with the biomes that could be included. The Dwell Dark is the area between the realm of mortals, and the realm of demons. The realm of demons being where the Dark Mother hails from. It is a dark, shadowy place. So, dark, in fact, that it seems to corrupt the torches or any external light that are placed here, eating them away and snuffing them out. The only light that can be gleamed is from the precious Managnetite has consistency in this dreadful place. It's blue glowing hue dotting in the dark, the bane of creatures that call this place home. Dark shadowy terrors dwell here, and not the kind that enjoy the company of the demons you command. Though, a few of these denizens might be persuaded to join your cause, most would much rather eviscerate you in this darkened void. I was thinking torches would need to be hand made here and maintained by imps, or, fires should need to be hand made and only remain lit with a constant supply of wood. Imp head candles would lose particle effect when down here. Managnetite is found here. Providing a fitting trail for gaining the previous resource. Occasional 'demonic' Biomes could be found here, creatures that, like the dark mother, are attempting to escape their imprisonment from the 'Fiery Down Below'. These demonic entities could be less powerful than the ones found on the depth plain below, and would not be friendly with that native shadowy inhabitants. One can not simply 'tunnel down' into the Dwelldark. But must find special openings of soft rock in the hard rock bottom of the depth plain above it. Digging one out will grant access, but, also, will spawn raids from the creatures of the Dwelldark. The place where the Dark Mother hails from, and yet, it seems, she (he?) was not the largest fish in the pond. Ditto, with that much content it's gotta have some gems in there, but I got bugs on my mind. Gonna have to come back to this one later. Anyway, I'm glad you guys responded so quickly. Though, I should note, there's a lot more (you can look at the outline to get an idea), it's just not really easy trying to convey everything while trying to get everything as organized as possible. Originally, there was going to be 13 separate posts to keep everything neat. But the forum doesn't like separating posts when you reply to yourself, so, I suppose now it'll be just one giant post with 13 subdivisions I will have to mark out an make a little clearer so it's a little easier to take in and cross search concepts that connect to one another. I've been working on this for some time and have made some progress. Mostly, I am bumping this to show off that my section on ideas for the Surface World has been completed (I think), since I know that's kind of a hot topic right now. It can be found in Section 5, Depth and Biomes. Other things have changed besides this, but mostly just lay out things to make the whole thing a little easier to digest. This is still an open thread, as well, so, don't feel the need to be shy. I know that this whole thing is a little overwhelming considering the volume. But don't let that stop anyone from expressing opinions on specific things. You don't need to read everything to make a comment. I'm trying to make this as skimable as possible for a reason. A lot of interesting ideas. An entertainment room might be an option in the future as well as more food types. Different depth levels are also of interest but as I told you when we chatted Rasmus will focus on the surface world first of all. Rasmus will take a closer look at your suggestions as soon as he has time. Current time: 23-04-2019, 08:50 PM Powered By MyBB, © 2002-2019 MyBB Group.